A large selection of window headers to emphasize and enhance widows. 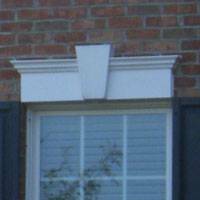 Window headers are available with compatible keystones and select window headers can be customized with keystones. 985-80 - 9 in. Window Crosshead - 80 in. Window Header Overall Width: 85-1/2 in. Window Header Height: 9 in. Window Header Base Width: 80 in. Window Header Projection: 4-1/2 in. 985-72 - 9 in. Window Crosshead - 72 in. Window Header Overall Width: 77-1/2 in. Window Header Base Width: 72 in. 985-68 - 9 in. Window Crosshead - 68 in. Window Header Overall Width: 73-1/2 in. Window Header Base Width: 68 in. 985-48 - 9 in. Window Crosshead - 48 in. Window Header Overall Width: 53-1/2 in. Window Header Base Width: 48 in. 985-46 - 9 in. Window Crosshead - 46 in. Window Header Overall Width: 51-1/2 in. Window Header Base Width: 46 in. 985-42 - 9 in. Window Crosshead - 42 in. Window Header Overall Width: 47-1/2 in. 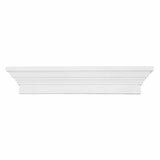 Window Header Base Width: 42 in. 985-38 - 9 in. 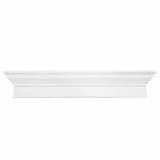 Window Crosshead - 38 in. Window Header Overall Width: 43-1/2 in. Window Header Base Width: 38 in. 985-36 - 9 in. Window Crosshead - 36 in. Window Header Overall Width: 41-1/2 in. Window Header Base Width: 36 in. 985-35 - 9 in. Window Crosshead - 35 in. Window Header Overall Width: 40-1/2 in. Window Header Base Width: 35 in. 985-200 - 9 in. Window Crosshead - 200 in. Window Header Overall Width: 205-1/2 in. Window Header Base Width: 200 in. Window Header Overall Width: 109-1/2 in. Window Header Base Width: 104 in. 985-100 - 9 in. Window Crosshead - 100 in. Window Header Overall Width: 105-1/2 in. Window Header Base Width: 100 in. 685-85 - 6 in. Window Crosshead - 85 in. Window Header Overall Width: 89-3/4 in. Window Header Height: 6 in. Window Header Base Width: 85 in. Window Header Projection: 3-7/16 in. 685-72 - 6 in. Window Crosshead - 72 in. Window Header Overall Width: 76-3/4 in. 685-36 - 6 in. Window Crosshead - 36 in. Window Header Overall Width: 40-3/4 in. 685-28 - 6 in. Window Crosshead - 28 in. Window Header Overall Width: 32-3/4 in. Window Header Base Width: 28 in. 685-197 - 6 in. Window Crosshead - 197 in. Window Header Overall Width: 201-3/4 in. Window Header Base Width: 197 in.